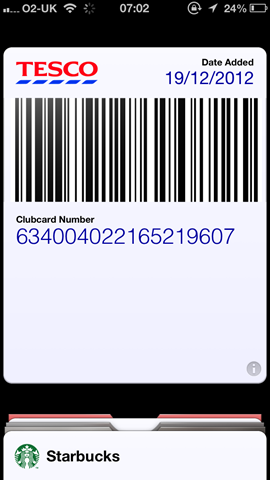 Put your Clubcard in your Passbook! Earlier this week I was chatting with somebody on Twitter about how they had lots of barcodes that they’d like to get added into their Passbook on iOS6. Since Passbook doesn’t officially support 1 dimensional barcodes, this is a problem. Whilst thinking about the problem I came up with a simple alternative. Rather than using the standard Passbook barcode location, I generate a new barcode and place it as an image directly into the pass. This gives you your Tesco ClubCard barcode, but within a Passbook pass. I went one step further and also allow you to select a particular Tesco store location. This means the pass will appear on your lock screen when you’re near this store! Check it out and give it a go. I’ve had success using this pass in Tesco, but others have reported problems. This is down to the type of scanner being used. Some of them just can’t read glass very well. Please let me know in the comments section what you think and if you do try it, let me know if you have any success! ← The parts of my new PC have arrived!